Well over 35 Freemasons attended the installation meeting of the Lodge of Great Endeavour No 3597, to support and witness Chris Cullen being installed into the chair of King Solomon. The lodge was honoured by the presence of Kevin Poynton, Assistant Provincial Grand Master. The lodge was opened by Eric John Hancox (John), WM and the normal administration duties undertaken in the usual form. The lodge was opened in the second and third degrees and then the principal guest Assistant Provincial Grand Master Kevin Poynton, was admitted in due ceremonial style. Kevin was accompanied by grand and Provincial grand officers including Dennis Rudd, Jack Forsyth, Gordon Amos, Chris Eyres and Chris Gleave, (group vice-chairman). Ken Smith and Eric Delamere acted as Provincial grand deacons. John welcomed all present saying it was a great honour and privilege to see so many very distinguished brethren attending this special occasion and continued by saying he hoped everyone would have a most enjoyable evening. Kevin thanked John and the brethren of the lodge for their very warm welcome and commented that he was very much looking forward to witnessing the installation and he brought the sincere good wishes of the Provincial Grand Master, Tony Harrison. Pictured left: Chris Cullen (left) with Norman Pritchard singing the master’s song. Pictured right: Kevin (left) receiving flowers from Chris. John, as a matter of procedure and as a mark of respect, offered Kevin the gavel, which on this occasion he indicated that he was delighted to accept and even more delighted to return it as quickly as possible. The lodge was adjourned in the third degree and work was resumed in the second degree. John asked Charles Carr to assist him by occupying the SW’s chair, John Moreton to occupy the JW’s chair and Henry Clare to act as IG. All the brethren accepted, saying it would be a great honour. 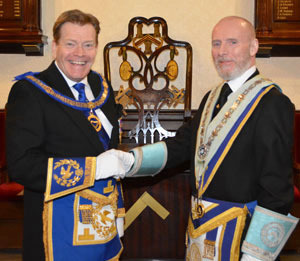 John Walsh presented Chris to the WM to receive at his hand the benefit of installation. John was then installed according to ancient custom into the chair of King Solomon. The ceremony was conducted with sincerity. The third degree working tools were explained by Robert Carr, second degree tools by John Hancox and the first degree tools by Terrence Ford. The address to the WM was delivered with great dignity by John Walsh. Chris Gleave delivered the address to the wardens and Kevin delivered the address to the brethren of the lodge which completed the installation ceremony. Brethren of the lodge singing ‘Welcome to our guests tonight’. Immediately following the installation, Kevin, on behalf of the Provincial Grand Master Tony Harrison, congratulated Chris on being installed into the chair, for the first time in West Lancashire. He also praised all the officers for the smooth running of the ceremony and the members of the lodge for their work, particularly John Hancox as the installing master and John Tyrer as director of ceremonies. He also gave special thanks to the members for their work on presenting the working tools, particularly Terrence Ford. He extended his good wishes to all present and hoped Chris and all his officers would have a happy and productive year and wished everyone the best of health to enjoy it to the full. 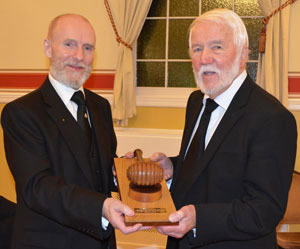 Chris (left) carefully handing over the ‘Travelling Gavel’ to Stuart Ainsworth WM Lodge of Charity. At this moment John conducted his first duty, which was to present the charity donations to Kevin. The donations were to; MCF 2021 Festival £500, Warrington Masonic Hall £500 and Ecclesholme £100, resulting in a grand total of £1,100. Kevin received the donations saying how pleased he was to receive such a large sum of money. He praised all concerned saying it was such a wonderful amount and thanked the lodge and brethren on behalf of the recipients, stating that the donations would be gratefully applied and would make a difference to people’s lives. Kevin also commented on the commendable donation to the Masonic hall. The hall catering staff supplied an excellent four course meal for the festival of St John, which consisted of broccoli and stilton soup, plaice goujons, roast beef with Yorkshire pudding, roast potatoes and seasonal vegetables and fresh fruit salad. Red and white wines were also served during the meal with tea or coffee to follow, which was very much enjoyed by the members and guests. Kevin responded to toast number three and remarked on the following; grand lodge, once again he thanked the lodge members for the excellent donations and asked them not to stop contributing. He congratulated all the members present who are about to gain Provincial honours or promotion, including Chris Cullen to acting rank of Provincial Grand Steward and Robert Phillips to Past Provincial Grand Superintendent of Works. Kevin continued by thanking Ian Halsall and Stephen Clarke for attending and thanked Ken Smith and Eric Delamere for acting as Provincial grand deacons, also John Starkey for his work as group publicity officer, for keeping Warrington at the forefront in publicity. Pictured from left to right, are: Chris Eyres, Jack Forsyth, Gordon Amos, Kevin Poynton, Chris Cullen, John Hancox, Dennis Rudd, Chris Gleave, Stephen Clarke and Ian Halsall. The master’s song was sung by Norman Pritchard, accompanied by Brian Wilson. Before leaving for home, Kevin and Chris were presented with bouquets of flowers on behalf of the lodge members. Both thanked the WM and brethren for the flowers and a most enjoyable and memorable evening. Brethren joined together to sing ‘Welcome to our guests tonight’ which was well received by all the visitors. The Lodge of Charity No 2651 having five visitors present just pipped the Lodge of Lights No 148 to claim the Travelling Gavel.The evening was brought to a close by Bill Wainwright offering the tyler’s toast.